Talk to him long enough about his vision for Nebraska, and Husker head coach Scott Frost will start to sound like more of a scientist than most football coaches. The word “formula” gets tossed around quite a bit. At Big Ten Media Days in Chicago, he said it 12 times over the course of an hour. Nebraska went 4-8 last season and hasn’t won a national championship since his playing days in Lincoln. He’s tasked with fixing the last 20-something years of Nebraska not being in that “upper echelon” he thinks it belongs to. And as the team begins fall camp, a month away from its season-opener against Akron, Frost feels like he has the right formula to restore the Huskers. The strange thing is when he takes about what exactly that formula is, he hits on two different philosophies from two very different eras of college football. Frost’s playing career was influenced by Nebraska legend Tom Osborne, but his tactical coaching career has largely been shaped by Osborne’s coaching inverse, Oregon’s Chip Kelly. Where Dr. Tom is I-formation and power running and back-breaking defense, Kelly is spread and misdirection and neck-breaking speed. When Frost was at Oregon (from 2009-2015) and the Ducks lost physical fights, it frustrated him. The Oregon stereotype was that it lacked physicality, and when it lost to teams like Stanford and Ohio State, the stereotype seemed reinforced. “To be honest, we got beat a little bit physically in those games and, as a former Husker Power Nebraska quarterback that saw what made Nebraska great, it frustrated me,” Frost says. Frost bought into the system immediately when Kelly brought him on to coach wideouts, no skepticism. He saw it as revolutionary. He still finds some amazement in how quickly Kelly’s attack made Oregon a national power. Doesn't mean it can't be built on. “I always said back then if we could take this [Oregon] offense and this speed development and our scheme and marry it with old-school Husker Power we won’t lose a game,” Frost said. And it has needed to evolve. With almost the entire Pac-12 now running some variation of what Kelly used to at Oregon and the up-tempo spread running wild throughout the larger college football landscape, Frost says you have to continue to push the envelope to stay on top. “If you’re not evolving and getting better, you’re falling behind,” he says. So, when he left Oregon for Central Florida, he took that system and did exactly what he talked about doing. He brought in Husker Power and introduced it to Chip Speed. The thing is, now that formula is getting another tweak, some new ingredients. (Or, old in this case.) Duval came with Frost to Nebraska. As did several other former Huskers in assistants Barrett Ruud, Ryan Held and Greg Austin. They know how important this program is and how much pressure they have to get the new concoction right. 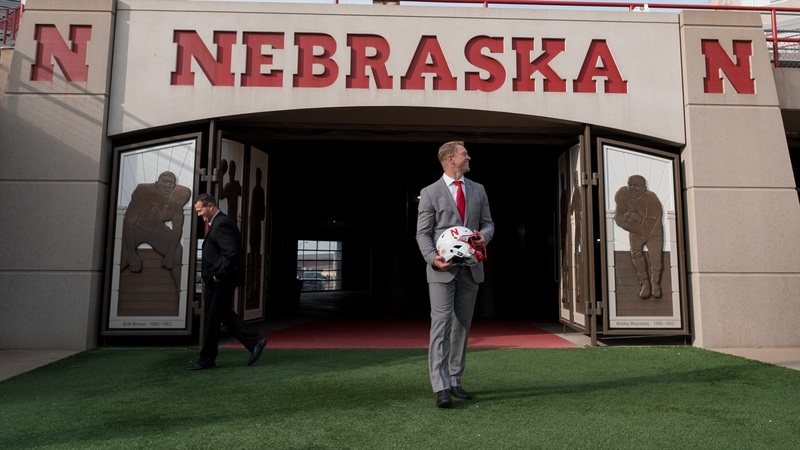 The tempo practices have been an adjustment for the players and the quarterbacks are going through the ringer learning everything asked of them in the new scheme, but Frost has also wasted no time putting into motion changes to bring back some of the things he says made Nebraska great. With the right administration in place above him, one that shares Frost’s view, they’re trying to bump up the roster size to breathe some new life into that walk-on program. They’ve also moved back to morning practices and split up the locker rooms. As he sits in his office, overlooking the Huskers’ weight room, Frost is watching Duval rebuild the strength program day by day. “I got back to Nebraska and they hadn’t really squatted in three years, weren’t lifting very much, our guys were out of shape, I didn’t really see the passion and the unity, [and] the walk-on program was killed,” Frost said. “I was just talking to somebody last night about my senior year and how many of those guys started out as walk-ons. By the time we were seniors, they were grown men that were ready to go out and mess some people up. "That worked at Nebraska and we have decided to take, a couple different times in our program’s history, right turns at Albuquerque and go a completely different direction and the results haven’t been good. One of those building blocks is, undoubtedly, 'The Pipeline.' Frost won’t even entertain the thought they can’t run the stuff they want and still have big nasties winning in the trenches. “You have to really put an emphasis on being physical to have the type of o-line play that you want,” he says. “You can do that in any offense so scheme may be just an excuse, like a lot of excuses I’ve heard for why Nebraska hasn’t performed well, but you’ve got to emphasize it. That approach for the longest time was pulling Midwestern kids that grew up wanting to play at Nebraska — athletes that could be built into dominant offensive linemen — putting them in the weight program and rolling. In Chicago, Frost dropped the line “Wisconsin has been out-Nebraska’ing Nebraska” and for the most part, he’s talking about line play. He was asked if offensive linemen now would choose to come to Nebraska instead of Wisconsin. His answer was an emphatic yes. When it comes to actually recruiting those guys, Frost knows he needs results to back up the talk. But those aren’t the most pressing issues right now. The results, he believes, will come. Now it's about rebuilding what they have. The entire offseason has been devoted to reshaping the team that went 4-8 last year. There are different pieces, sure, but there are scars that needed to be massaged. Before fall camp opened on Thursday, linebacker Luke Gifford talked about rebuilding a trust between the players and their coaches. Lineman Tanner Farmer said the team needed direction it didn’t receive last season. Defensive end Freedom Akinmoladun talked about culture. “They were able to bring us together for the common cause,” Farmer said. The weight-lifting regiment has changed. Frost says the team will “inevitably” lift more in-season than they’re used to because when he arrived, they weren’t lifting how he and Duval expect. Frost says Nebraska has “the best of the best” when it comes to strength and conditioning and nutrition programs; they just haven’t been utilized. They will be again. “He’s a very smart guy,” Osborne says of Frost. “He’s been a lot of places and coached and played for a lot of coaches so he’s probably about as well-prepared as anybody we’ve ever had here to take over and really do great things with the program. So far so good. Now it's about how well the rest of that formula comes together.